When J. P. Morgan called a meeting of New York’s ﬁnancial leaders after the stock market crash of 1907, Hetty Green was the only woman in the room. The Guinness Book of World Records memorialized her as the World’s Greatest Miser, and, indeed, this unlikely robber baron — who parlayed a comfortable inheritance into a fortune that was worth about 1.6 billion in today’s dollars — was frugal to a fault. But in an age when women weren’t even allowed to vote, never mind concern themselves with interest rates, she lived by her own rules. 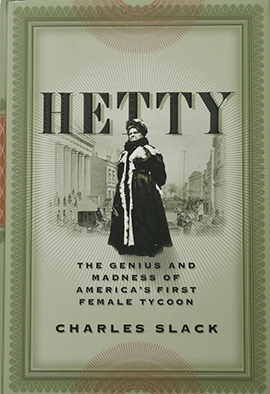 Hetty reexamines her life and legacy, giving us, at long last, a splendidly “nuanced portrait” (Newsweek) of one of the greatest — and most eccentric — ﬁnanciers in American history. A wonderfully detailed new biography . . .Today’s vilified moguls look like pussycats by comparison. More than the story of an eccentric, driven woman, it is a window on the country between the Civil War and World War I.
. . . Charles Slack gives us, at long last, a truly rounded portrait of one of the most fascinating characters in Wall Street, or, indeed, American history. In doing so, he rescues from caricature the uniquely gifted and uniquely sad Hetty Green. Winner of the Elle magazine Reader’s Prize for biography and the Connecticut State Book Award for biography 2005. “…Hetty’s madness, such as it was, served a vital purpose. By casting off the trappings and social expectations of her time, she freed herself to do as she pleased, to live life on terms that she alone determined. Unlike Carnegie, Morgan and Vanderbilt, who transformed their spotty reputations through philanthropy, Hetty Green left no monuments to herself. She therefore left it up to others to determine her legacy — and this process has not been kind to her. In her own time, she was regarded with a roughly equal mix of admiration for her ﬁnancial skills and disdain for her parsimony. In the century after her death, as the immediacy of her ﬁnancial prowess receded, she slipped into obscurity, remembered (when remembered at all) as a mean old woman with too much money and too little heart. Probably the most succinct and widely disseminated version of this portrait may be found in the Guinness World Book of Records where Hetty is listed, along with the largest lobster, the smallest antelope, and the champion hot dog eater, as the “greatest miser.” “She was so mean that her son had to have his leg amputated because of delays in ﬁnding a free medical clinic,” the item states. “She herself lived off cold oatmeal because she was too mean to heat it, and died of apoplexy in an argument over the virtues of skimmed milk” (emphasis in original). Like most legends, this description contains kernels of truth wrapped in myth, exaggeration, and caricature. She was, indeed, extraordinarily tight with her money. Some of the things she did were shocking. She never apologized for the way she lived, and it won’t do to apologize for her now. But her life eludes simple classiﬁcation, and “miser” is a particularly unsatisfying term, for it implies a soul that is withered, dull, and desiccated — almost devoid of life. One day my mother told me about a silver porringer given to one of my ancestors by a once-famous financier named Hetty Green. Except for the brief description I’d read as a child in Guinness Book of Records (under the heading “world’s greatest miser”) I didn’t know much of anything about her. I began to do some research about Hetty. What I found was a character who, for all of her quirks and oddities, was also a woman of exceptional courage and financial genius. In an age when women weren’t even allowed to vote, she went head to head with the titans of the Gilded Age and built a massive fortune. As the first female tycoon of Wall Street, she was a true pioneer. Hetty has been optioned for film by noted producer Ed Pressman.